After a year of cycling and dieting I'm no longer obese. 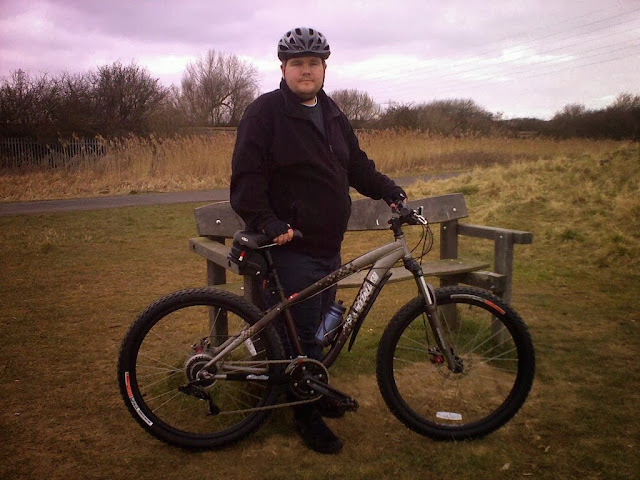 I started dieting on 8th March 2010 and was super morbidly obese at 131.8kg (290.6lb/20st 10lb) with a BMI of 45.6. Having weighed myself this morning, I'm now classed as 'overweight' at 86.6kg (190.9lb/13st 8lb) with a BMI of 30.0. More targets smashed. However, still a way to go yet. Having lost a total of 45kg (100lb) in a year makes me feel (and some would say look) fantastic. I rarely have pictures taken of me on or off the bike, but below is one fellow rider Jean-François took of me on Saturday. I've included on taken a year ago for comparison. I know this sounds cheesy, but if I can do it, so can you! Brilliant mate! You do look fantastic! Said in an encouraging masculine non suggestive kind of why obviously! Wow, what a difference a year makes. Very many congratulations! Will be interesting to see where your weight stabilises - do you have a target in mind? Yee Hah! Feels good dunnit? What a great feeling! Makes all the effort worthwhile. Who is that bloke in the second picture?! Good work mate! get away from the edge of that bloody cliff! Love the jacket BTW, what is it? Have you got a link? My one is now too baggy. Cheers for all your positive comments guys. It means a lot. Dave - I always thought I carried the weight well and most people that know me never knew I was so heavy. Tell you wife thanks for the comment ;-). I'm not sure what weight I want to get to. I think I will use body fat as the guide. It'll take some time but I think 15% is the target I should aim for. Clive - That jacket I got from Emma. It's originally from Aldi. Can I ask about your typical diet and how it has changed? Cheers for you positive feedback. My diet now consists or more fruit and vegetables, smaller portions and three meals a day. Breakfast was often skipped before. I rarely eat chocolate, cakes, sweets, crisps etc. Snack foods and those high in saturated fat rarely feature in my diet. I also now never eat after dinner time. If you have any other questions, please get in touch. I am now where you were a year ago (but quite a bit lighter than I was a year ago!). So, I am inspired by you, Clive and others. I also noticed that you were riding a mountain bike when you started and now a road bike. All big guys seem to do this. That's properly impressive mate. It also reminds me of the fantastic holiday I had with the family in Summer 2009, where I got some lovely photos on Beachy Head. Happy days! Just found you, via Twitter. Congrats on substantial weight loss. An inspiration. I'm attempting to lose 30lbs, to get below 190, using cycling as the catalyst. If you can do it, maybe I can, too. Keep up the good work. Also just found you via twitter. Very inspiring. I am a similar starting weight to you. Can I ask how far you used to ride when you first started? Or did you lose some weight through diet alone first? BHF diet, 30 mins a day of exercise and take it from there. I've started at the gym doing 30 mins most days but I just remember last time I got on a bike how knackered I was and how slow I went! I suppose we've all got to start somewhere though and even if you don't go far in that 30mins it's better than nothing! Congratulations Toby. I note that at your starting weight you opted not too go too close to the cliff's edge. Wise thinking. Now, one year later on, you can stand near the edge and stare at fear in the face. Keep cycling; keep fit; be happy. Wow Toby! The pictures really show the difference. You have made amazing progress. If in a years time I have done half as much I will be happy. You should be very proud of yourself!! Brilliant, brilliant stuff and very motivating for me! Big Clyde - It humbles me that you are inspired by me but I too was inspired by Clive and others when I started. 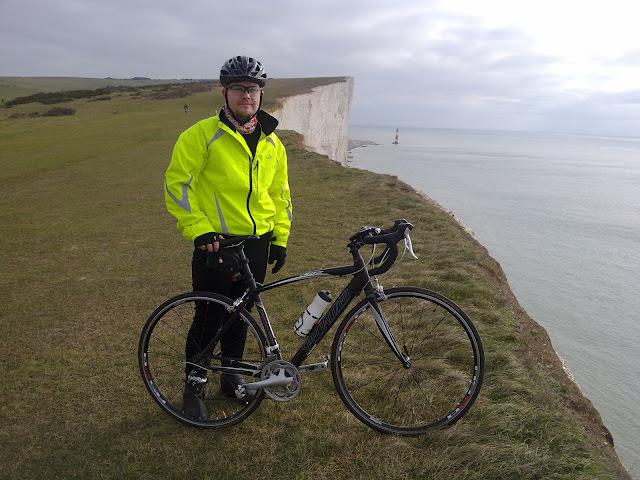 I switched to a road bike back in August, 5 months in. It was a logical step due to the fact most of my riding was on road and it's more efficient and faster. As it happens, there is a 17st weight limit on the carbon seat post my bike has and I was just under that when I got it! Josh - Having used cycling as a way to help me lose weight I can definitely recommend it. However, you must be under no illusion that cycling can do it all for you. You need to look at your diet and change it, and for some that will be a drastic change. Peter - I've not done a top ten tips but you given me the idea to do it. Mandy - The diet and cycling start at pretty much the same time. I started with a 3 mile daily commute choosing to drive the other 17 miles. As my strength and fitness increased, so did my mileage. Have a look at my old articles from March/April 2010 for details. One Loose Nut - Ha ha, like your thinking. As it happens, that was just where I was at the time. Today I've taken a new version of my original picture to go in my next blog post. You'll be able to see exactly what the change is. Si - It always surprises me how much I've achieved. I look in the mirror and am always shocked at what a different person I look like. Stick with it and you can do it too. Joby - I can't believe it! Advice needed please on appetite. After cycling I could eat a horse!! Purpletrumpet - I must be lucky because I've never felt hungry after riding. Even after 50+ mile rides. After a year of riding I still consume less calories than my body burns and I rarely feel hungry.